It took him 22 holes but Phil Mickelson won his big match against Tiger Woods. The Match between Tiger Woods and Phil Mickelson had plenty of action -- in their checkbooks early and on the fairways late. The Match went a full 18 holes, plus four holes of overtime, to everyone's delight. What did you miss? We've got you covered below. Who won: Phil Mickelson Why it matters: Because Tiger has beaten him his entire career! And because $9 million was on the line! And because it went to 22 holes! Seriously, it was a nice addendum to a rivalry that has spanned many years. Woods usually got the best of Mickelson. Not Friday. How it happened: Woods and Mickelson traded challenges and barbs throughout, but the golf was never actually that great. Mickelson won multiple holes with a par. The longest putt made was just inside 15 feet. All square through 18 holes, Tiger Woods made par on the 19th hole (replaying the 18th) and conceded a par to Mickelson en route. The pair then headed to the "20th hole," which began from a "tee box" on the putting green and finished at a newly cut cup on the 18th green, with floodlights streaming over it all. Woods's approach landed long while Mickelson's landed on the green, right of the hole. 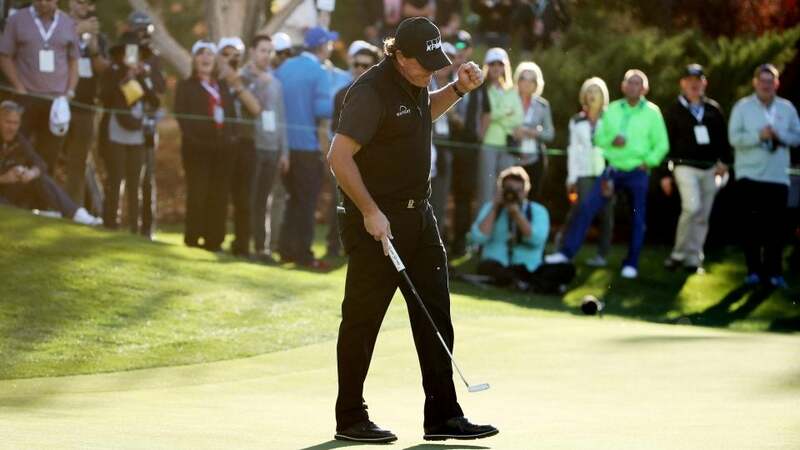 Mickelson's putt to win came up short and they returned to the tee for the 21st. Surprisingly, Woods flew the green again (!) from 93 yards. When he was unable to chip in for birdie, Mickelson had six feet for the win...and he blew it by! His putt never touched the hole. Back to the tee they went. This time Woods tossed in his wedge to eight feet...and Phil tossed in his own to four feet. Woods hit another poor putt and Mickelson poured his in for the victory. In doing so, he claimed $9 million to go to a charity of his choice and a gold-plated belt buckle. Phil Mickelson took home these goods with a birdie on the 22nd hole. Best shot: Mickelson once predicted he would close Woods out on the 17th, and it looked like he might. Mickelson was one up on Woods and in great birdie range. But Woods, as he has done for years against Mickelson, chipped in to reverse the momentum. Mickelson failed to convert and The Match was all square again and headed to the 18th. Notables: Mickelson almost perfectly predicted his first hole. In an opening side bet, he put $200,000 on the line to birdie on the first. He just barely missed the putt, and what did he look up to? A smug smile from Woods. “That hurts the pocket,” Woods said. Mickelson had a chance to win it all with a 32-foot eagle putt on 18, but just missed. After Woods made a 5-footer for birdie, he kindly conceded Mickelson’s remaining four-footer to extend it to a 19th hole. Also of note: Bleacher Report executives scrapped the $19.99 price of the pay-per-view package. The purchase element malfunctioned and paying consumers were unable to view the program, so the streaming service became free for everyone.